We receive Title I funding, which allows us to implement programs that provide our students with the best possible opportunity for learning and growth. We have an all-day kindergarten program, and our students enter first grade prepared to succeed. We provide an after-school tutoring program to assist those students in need of some extra time and attention. 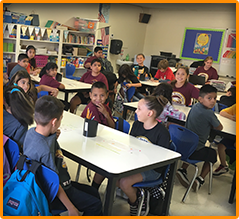 We give our students daily education in the development of positive character traits, and we see great progress in our students as they strive to demonstrate the qualities of responsible, respectful citizens. We live in a supportive community, where parents, families, and neighbors are invested in the success of the students at our school. Please visit our Registration page to learn more about how to register your child at our school. We look forward to welcoming you!